Cheng Fei, unsurprisingly, took vault with a DTY and a laid-out Podkopayeva for a 15.050. Ariella Kaeslin took second with a Rudi and a 1.5 Yurchenko, losing to Fei by less than .05 (she finished with a 14.912), although naturally Fei didn’t pull out her biggest vaults. And Aagje Vanwalleghem took third with a 14.425, just over Elsa Garcia‘s 14.400. It appears that Vanwalleghem and Garcia actually had aBeijing uneven bars finals moment: they had the same A-scores and B-scores, but Vanwalleghem won. Elena Zamolodchikova performed a DTY and a Yurchenko half-on 1.5-off but sat both down to finish sixth. (The second was also devalued to piked.) Apparently, though, she’s in shape, which I believe means better than she was at DTB. Hiu Ying Angel Wong finished last with a full-twisting Tsukahara and a handspring front tuck, which she fell on. On the other hand, it was the first time a Hong Kong gymnast had made the WCF. Jana Komrskova also had an off day, after giving up her spot in Beijing to younger gymnasts, with a Yurchenko half on tucked one-half off and a Yurchenko full. IG seemed to suggest that she was not at her top level, despite being in shape. Honestly, we all knew the vault final wouldn’t be very interesting, and that Cheng would win. The next highest-ranked person was Zamolodchikova, who didn’t seem to be in top form at DTB. Despite being ranked above Kaeslin, Komrskova has been out of competition for quite a while, so it was hard to imagine her being in top competition form. Apparently Garcia got the most applause of everyone — I know a lot of people were excited to see Mexico’s best gymnast ever back in competition! I certainly was. Too bad she missed the medals. I’m happy to see Vanwalleghem come away with the bronze, especially after turning down the International Challenge in Belgium that was also taking place this weekend. This is Belgium’s first WCF medal. What vaults did we see? Obviously Cheng wasn’t going to perform her hardest stuff in this field. She did a DTY and a laid-out Yurchenko half-on 1.5 off, which gave her actually only the second-highest combined A-score (5.8+5.6=11.4), after Kaeslin. Kaeslin performed a Rudi and a 1.5-twisting Yurchenko, for an A-score of 11.8. The only other person besides Cheng to perform a DTY was Zamolodchikova, who complemented it with a Yurchenko half-on 1.5-off (recorded as piked), for a combined A-score of 11. Unfortunately she was not able to exploit that A-score with a high enough B-score, landing on her knees on both. Garcia, Boczogo and Vanwalleghem also all performed 1.5-twisting Yurchenkos. Garcia and Vanwalleghem then both performed a piked Yurchenko half-on 1.5-off to Boczogo’s handspring front one-half piked, giving them a .2 advantage over Boczogo. (Boczogo also fell on her 1.5 Yurchenko.) Komrskova and Wong had the lowest A-scores: Komrskova did a tucked Yurchenko half-on 1.5-off for a 10.0 A-score; and Wong did a full-twisting Tsukahara and a handspring front tuck, which honestly is a junior vault (A-score is 4.4) for a total of 8.6 A-score. We actually saw more diversity in vaults than we would see in the average vault competition, but vault still remains the most boring event. The only competitive vaults performed were: DTY, Rudi, 1.5 Yurchenko and Cheng’s laid-out Yurchenko one-half on 1.5-off. Everything else we wouldn’t usually see from the creme de la creme of vaulters. If there’s any apparatus on which I’d like to see a burst of originality, it’s vault. 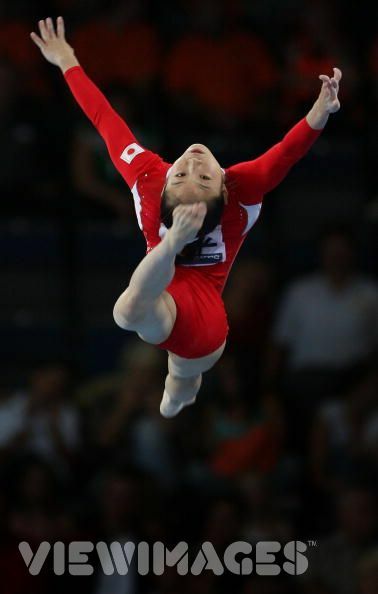 Honestly, the biggest surprise on bars was Yang Yilin’s scratch — with a “waist” (lower back) injury, according to Lu Shanzhen, which sounds like a pulled muscle. Apparently it is not serious. I certainly hope not! The title went to He Kexin with a 16.250, unsurprisingly, followed by Jiang Yuyuan, over .5 behind (15.700). Bronze went to Koko Tsurumi, who has really just amazed me recently. She was nearly .5 behind Jiang, but far ahead of Dariya Zgoba, who took fourth. Apparently He’s routine was a little shaky. She had trouble on the 1/1 on the low bar, which has actually given her trouble in the past, but did her Jaeger combo, etc. — she competed full difficulty, with a 7.7 A-score. Interestingly, she received B-scores in the 7.5 to 9 range, which is pretty huge. Not sure what happened there. The top three had by far the highest A-scores, which I think tends to be the case on uneven bars more than on any other apparatus. Jiang was also in the 7’s (7.1) and Tsurumi had a 6.8. The next highest score was Zgoba with a 6.2, then Anastasia Koval and Jana Sikulova with 6.0s. Koval finished a disappointing seventh after landing her head on the bar on a Stadler toe-on piked Tkatchev. Yikes. Zgoba also had a mistake, on her Pak to Stadler, on which she went the wrong direction. She actually had the same problem (on a different skill) on one of her routines at Beijing. Sikulova’s routine hasn’t changed much recently; I find it pretty boring, if technically correct. She finished fifth. The disappointment of the day was probably for Daniele Hypolito, who honestly isn’t very strong on bars anyway. She finished with an 11.875 — ouch. She fell on two different elements — transition to high bar, when her feet slipped; and a Stadler. Apparently her score was also lowered by three tenths for some kind of neutral deduction, but I’m not sure what it was. I think overall that bars always promised to be more interesting than vault. The three Chinese competitors (which went down to two went Yang scratched), were actually not ranked at the top of the list because they are relatively new competitors. We knew He was going to win, and that it was all but certain that Jiang would place. He could have had a fall and that still would not have made up the difference in A-score between her and Tsurumi. Anyway, there were two Ukrainians in the final. We know they have a beautiful bars heritage — and both are quite lovely on bars — but they are inconsistent and have fairly humdrum routines. It was great to see Sikulova — kind of like it was great to see Komrskova and Boczogo — but I didn’t really expect a medal for her. As for originality, I was surprised when I made my bars Top 8 list to discover that bars have ultimately been pretty boring recently. Take a look at the dismounts we saw today: three double fronts, three double layouts. He did the only unique (by which I mean, not done by anyone else at this meet) dismount, a Tsukahara. Yesterday when I read that the FIG was doing a “live broadcast,” I took them at their word, but in fact I was slightly unconvinced because there was no information about where you might see it. I wish the FIG would hire a publicity person for the Web site whose first language is English. (“Broadcast” is not the same as “commentary,” among other things) Seriously. Also, do you think the photo galleries have been updated? The answer is no. Tomorrow we see beam and floor finals. We’ll finally get to see Sandra Izbasa, and Cheng will be competing for two more golds, both of which are entirely within her reach. It will be exciting to see Li Shanshan on beam, especially after all the rumors flying around about her weight gain and return to her provincial team. Meanwhile, Hypolito and Zamolodchikova both have a shot at redemption (Hypolito on both events, Zamolodchikova on floor). But honestly I don’t think Hypolito’s beam will medal, and while she is powerful on floor, I really dislike the sloppiness (also true of Daiane dos Santos and sometimes Lais Souza — it’s a problem). I don’t imagine Zamolodchikova will pull it off, but it would certainly be exciting. On beam we’ll also see Lauren Mitchell, who is lovely on that event, as well as Sanne Wevers who is just so clean. And finally, perhaps the part I’m looking forward to the most: Jiang’s floor.